Chicago Cubs rookie outfielder Tyler Colvin is in stable condition at Jackson Memorial Hospital in Miami after being struck by the end of a shattered bat during the second inning of Sunday’s game against the Marlins. The bat punctured the left side of Colvin’s chest just below the collarbone. 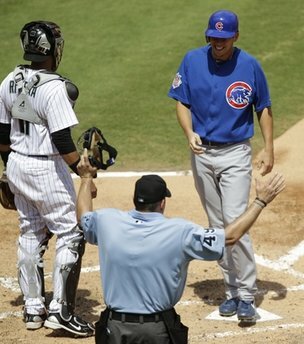 He was taken to the trauma center and underwent a battery of tests, a Cubs spokesman said. Colvin had minimal external bleeding. Colvin was leading off third base when catcher Wellington Castillo doubled to left field. It appeared he never saw the bat coming as he was watching the ball. Colvin continued toward the plate after being struck, scored the run and headed toward the dugout. Note- My sister-in-law works as a nurse at Jackson Memorial. Colvin is all right, which is what matters. Someone may use this an argument for pro baseball to switch to aluminum bats since they are used at all amateur levels. On the other hand, there has never been a MLB player seriously injured by a broken bat. I don’t care either way myself. He won 286 games pitching for the Phillies when the franchise was mediocre or worse most of the time. Roberts gave up more homeruns than any pitcher in baseball history. Basically he challenged hitters to hit him but Roberts was one of those pitchers(Catfish Hunter, Tom Seaver, Jack Morris) who could do it and win even if some of them were home run prone. Roberts served in the Air Force and attended Michigan State before his pro baseball days. After he was through playing, Roberts was head baseball coach at the University of South Florida. RIP. Philadelphia Phillie trivia- Who is the only Phillie pitcher since 1930 to win the National League MVP award? It is not Roberts. The answer will be at the bottom of this post. Long before pitch counts, setup men and closers, Robin Roberts usually finished what he started. Roberts, the tireless Hall of Fame pitcher who led the Philadelphia Phillies to the 1950 National League pennant as part of the famed “Whiz Kids,” died Thursday at his Temple Terrace, Fla., home of natural causes, the Phillies said, citing son Jim. He was 83. The right-hander was the most productive pitcher in the National League in the first half of the 1950s, topping the league in wins from 1952 to 1955, innings pitched from ’51 to ’55 and complete games from ’52 to ’56. He won 286 games and put together six consecutive 20-win seasons. Roberts had 45 career shutouts, 2,357 strikeouts and a lifetime ERA of 3.41. He pitched 305 complete games, but also gave up more home runs than any other major league pitcher. Phillies pitcher Jamie Moyer is on the verge of breaking that mark. The 47-year-old Moyer has given up 498 homers, seven fewer than Roberts. Roberts played in an era when pitchers expected to go the distance. Put it this way: In the past 25 years, Phillies pitchers threw a total of 300 complete games — five fewer than Roberts all by himself. Roberts made 609 career starts, finishing more than half. Long after his career ended, Roberts followed the Phillies closely and was still popular in Philadelphia, drawing boisterous applause from fans each time he came back. Trivia answer- Jim Konstanty won 16 games for the 1950 Whiz Kids. Konstanty did this as a relief pitcher. Though he did start game 1 of the World Series. He won 20 games for the 1956 Detroit Tigers and once was selected for the All-Star game. R IP. From Baseball Library- Hoeft was a mainstay in the Tigers starting rotation in the 1950s, then embarked on a second career as an itinerant lefthanded reliever, changing teams six times between 1959 and 1966. He spent most of his rookie season in the Detroit bullpen, then struggled as a starter in 1953-54, winning only 16 games over the two seasons. In 1955 Hoeft was still only Detroit’s third starter in terms of starts and innings, but he led the AL with seven shutouts on his way to a 16-7, 2.99 record and a spot on the AL All-Star team. In 1956 Hoeft became the first Tiger lefthander since Hal Newhouser to win 20 games, posting a 20-14 mark, but after mediocre seasons in 1957-58, Hoeft returned to the bullpen for the balance of his career. He was traded to the Red Sox for Ted Lepcio and Dave Sisler in May, 1959, then shipped to Baltimore for Jack Harshman six weeks later. Hoeft enjoyed his best seasons in relief with the Orioles, recording a 2.02 ERA in 1961 and four wins plus seven saves in 1962, then was traded to the Giants and later to the Braves, spending single seasons with each club. On July 14, 1957 Hoeft hit two of his three career home runs. He was a great player without question. A very good defensive shortstop who hit for power, Nomar wasn’t the prototypical player at shortstop. Hitting shortstops like Nomar usually have a tougher time proving their worth. Baseball historians usually see a shortstop with power as a lesser defensive player than his contemporaries. Of his generation, Nomar was no better than the 3rd best defensive SS out there. Omar Vizquel and Derek Jeter ranking but was there any one else? Thanks for the memories Nomar. Longtime Boston Red Sox shortstop Nomar Garciaparra retired from baseball on Wednesday morning, signing a one-day contract with the Red Sox in order to retire as a member of the team. “I’ve always had a recurring dream, to be able to retire in a Red Sox uniform,” Garciaparra said at a press conference at City of Palms Park. “Thanks to [owners] Mr. [John] Henry, Mr. [Tom] Werner, Mr. [Larry] Lucchino and [general manager] Theo [Epstein], today I get to fulfill that dream and retire as a Red Sox. “Earlier today, I did sign a minor league contract to be a part of the organization once again. I was getting choked up then, and I’m getting choked up now. I’ve got the chills. Garciaparra will join ESPN as a baseball analyst. He will be seen primarily on “Baseball Tonight” but will also serve as an occasional game analyst. The 36-year-old Garciaparra spent the first nine seasons of his 14-year career in Boston, where he developed into a fan favorite, a perennial All-Star and the best shortstop in team history. He won the American League Rookie of the Year Award in 1997 and won batting titles in back-to-back seasons in 1999 and 2000. His career average with the Red Sox stands at .323, with 178 homers and 690 RBIs. He finished his career with 229 home runs, 936 RBIs and a .313 batting average in 14 seasons. He was a cousin of Hall of Famer Bob Feller. RIP. Waukee native and former Major League Baseball player Harold â€œHalâ€ Manders died Thursday at The Village at Legacy Pointe in Waukee. He was 92. Manders, a right-handed pitcher, played parts of three seasons in the majors (1941, â€™42 and â€™46), mostly with the Detroit Tigers â€” but also two games with the Chicago Cubs. He broke into the majors, at age 24, in the same season as future Yankees star Phil Rizzuto. The 1941 baseball season Manders is remembered for Joe DiMaggioâ€™s 56-game hitting streak â€” still a major-league record â€” and the .406 batting average of Ted Williams (no player has hit over .400 since). In 30 major-league games, Manders produced a 3-1 record and 4.77 ERA, with an equal number of walks and strikeouts (28). 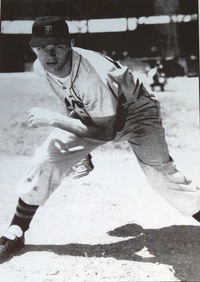 Manders, who attended the University of Iowa, was the cousin of Hall of Fame pitcher Bob Feller. Reliever Bobby Howry signed a one-year deal with the Arizona Diamondbacks on Monday. The D-backs have a club option for 2011, but terms of the deal were not disclosed. Howry, 36, pitched for the San Francisco Giants last season, going 2-6 with a 3.39 ERA in 63 games. He has pitched in 731 games during his 12-year career, with 66 career saves. The Diamondbacks have reshaped their pitching staff in the offseason, trading for pitchers Edwin Jackson and Ian Kennedy in a three-team deal with the New York Yankees and Detroit Tigers earlier this month. They also expect Brandon Webb to be ready for the start of the season, following his shoulder surgery last summer. While I am not optimistic about Arizona’s pitching bouncing back in 2010, I do think the acquisition of Howry, who has never started a Major League game, is a good move. He has been a more than solid setup man for over 10 years. Howry limited opposing batters to a .214 batting average in 2009 and was almost equally difficult on both righty and lefty batters. Any MLB team can make use of a pitcher with those skills and numbers. The Mariners and Chicago Cubs have announced a trade that sends outfielder Milton Bradley to Seattle for right-handed pitcher Carlos Silva. According to sources familiar with the deal, the Mariners will send a total of $9 million to the Cubs in the deal — about $3 million in 2010 and about $6 million in 2011. That money could allow the Cubs to obtain a center fielder and move Kosuke Fukudome back to right field. They’ve expressed interest in free agents including Marlon Byrd, Rick Ankiel and Scott Podsednik. But they’ve also explored potential trades for a center fielder — most prominently, Curtis Granderson, before he was traded to the New York Yankees. Silva is owed $11.5 million for both 2010 and 2011; in 2012, he is due either a $12 million option or a $2 million buyout. Bradley is owed about $23 million on his deal. Bradley batted .257 with 12 home runs and 40 runs batted in last season. He has a .277 career batting average, but his time in the majors has been beset by injuries and run-ins with teammates and fans. Through 2009, he’s played for seven teams in nine seasons, with 115 HRs and 439 RBIs. Silva signed a four-year, $48 million deal with the Mariners after the 2008 season and has been a disappointment in Seattle, going 5-18 the past two seasons. He appeared in eight games last season, going 1-3 with an 8.60 ERA. For his career, he’s 60-64 with two saves and a 4.72 ERA in 295 appearances with the Phillies, Twins and Mariners. For whatever it is worth, reports from Venezuela say Silva’s arm is healthy again. So why would Seattle trade him? Salary perhaps, or concerns about Silva’s arm may still be persisting. I see this trade as two teams wanting to rid themselves of high priced and risky property. Your guess is as good as mine if Chicago or Seattle make good from this deal. *- Another Milton Bradley, was a board game pioneer. Jason Kendall agreed Friday to a $6 million, two-year contract with the Kansas City Royals and is expected to become their everyday catcher. Kendall is a .290 hitter over his 14-year career. The 35-year-old was an All-Star in 1996, 1998 and 2000 but hit just .241 with two homers and 43 RBIs last season with the Milwaukee Brewers. He has 376 career doubles, 177 stolen bases and a .369 on-base percentage in a career that has included stops in Pittsburgh, Oakland and with the Chicago Cubs. Kendall also has been hit by 248 pitches, fifth most all-time. He gets $2.25 million next year and $3.75 million in 2011. He can earn an additional $250,000 each season in performance bonuses. The Royals did not offer a contract to Miguel Olivo, who led the team last year with 23 home runs, and aren’t expected to re-sign backup catcher John Buck. While the recently signed Ivan Rodriguez is twenty times more likely to be a future Hall of Famer, Jason Kendall has always been more my type of catcher. If you put aside Pudge’s arm, Kendall is better overall player. He gets on base, doesn’t hit into double plays, and the pitchers he has caught have posted better earned run averages than those working with Ivan. Kendall is certainly a very underrated player, but I have to admit he will never make the Hall of Fame. Ivan, barring some scandal, will make it when he becomes eligible. He won over 100 games in his 10-year major league career. After his playing days were over, Jansen worked as a pitching coach for the Chicago Cubs. RIP. Larry Jansen, the winning pitcher for the New York Giants in the 1951 playoff game decided by Bobby Thomson’s “Shot Heard ‘Round the World,” has died. He was 89. The San Francisco Giants said Jansen died at his home in Oregon on Saturday. Jansen spent nine years in the major leagues, making his biggest mark with the Giants during their pennant-winning season. He won 23 games in 1951, including one of the biggest in team — and baseball — history. Jansen, in relief of Sal Maglie, struck out two batters in the top of the ninth before the Giants rallied with four runs in the bottom half of the inning to beat the Brooklyn Dodgers 5-4 in the third and deciding playoff game. 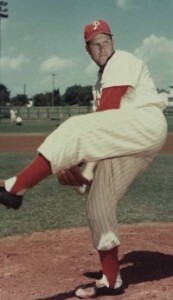 Jansen won 21 games as a rookie in 1947 and finished with a 122-89 career record and 3.58 ERA. 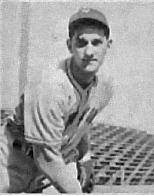 He spent eight seasons with the Giants before pitching briefly for Cincinnati in 1956. He allowed Mickey Mantle’s first World Series hit — a bunt single in Game 2 of the 1951 Series — and gave up a double to Joe DiMaggio in the eighth inning of Game 6, the final at-bat of the Hall of Famer’s career. Jansen was the losing pitcher in Game 2 and Game 5 of that Series. The Chicago Cubs baseball team filed for Chapter 11 bankruptcy protection Monday, a step that will allow its corporate parent to sell the team in an $845 million deal. The filing in Wilmington, Del., was anticipated and is expected to lead to a brief stay in Chapter 11 for the Cubs. A hearing on the case was scheduled for Tuesday. It comes as part of the Tribune Co.’s plans to sell the team, Wrigley Field and related properties to the family of billionaire Joe Ricketts, the founder of Omaha, Neb.-based TD Ameritrade. Tribune, which also owns the Chicago Tribune and the Los Angeles Times, filed for bankruptcy protection in December, but the Cubs were not included in the filing. The team’s run through Chapter 11 is expected to protect its new owners from potential claims by Tribune creditors. Tribune bought the Cubs in 1981 for $20.5 million from candy maker Wm. Wrigley Jr. Co. It announced plans to sell the franchise in 2007, but got tripped up by the recession and the collapse of the credit markets. The complexities of bankruptcy law fly far above my head. The Phoenix Coyotes last year. With the present state of the U.S. economy as it is, I wouldn’t be surprised if more teams or sports organizations go bankrupt.